Mix green salad with fruit and nuts. Heat a large non-stick skillet to medium high heat, add pecans and sugar. Stir on occasion. Cook for 5-7 minutes, until sugar is melted and crusted on pecans. Removing a small bowl, combine ground mustard, vinegar, olive oil, honey, dry oregano, salt & pepper. Whisk to combine.e from heat and place candied pecans on plate to cool. 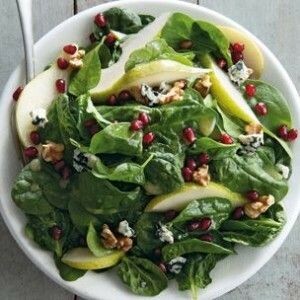 Add fresh greens, shredded Brussels sprouts, pomegranate, crumbled goat cheese, pear, and candied pecans to a large bowl.